BrookfieldAngler.com: BFA's first kayak outing! First, let me apologize for only having one photo for this entire story. As many of you know, the camera was ruined when my boat sank. For those of you that do not know that story, you can check it out here. Note - this story will also be my initial review of the Jackson Coosa Elite kayak. Not too long ago, I pulled the trigger on a kayak. It was a fantastic Ebay find that I couldn't pass up. 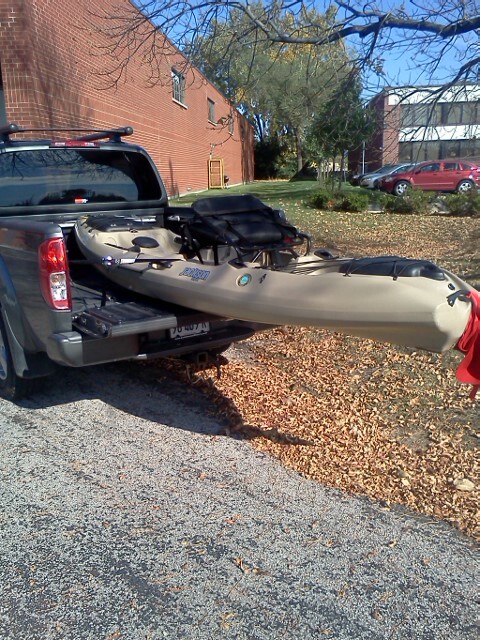 The kayak is a 2011 Jackson Coosa Elite and was a lightly used demo. I had originally set the morning hours of this past Sunday aside to go do some salmon fishing. Unfortunately, those plans never really fell into place, so I decided to take advantage of the opportunity and take the new yak out. After a bit of playing around and a few different attempts, I found the easiest way to load her up in the back of my Nissan Frontier. Once I was all loaded up, I headed out to my first choice of locations - the bowfin spot. Unfortunately, as I arrived, it was still way too swampy for me and I didn't feel like taking my first kayak trip in the smelly swamp. Instead, I decided to go to the Route 6 quarries in Joliet that opened to the public earlier this year. Keep in mind, I am brand new to kayaking and this was my first trip. With that being said, I nervously pushed off and gave it a couple of quick paddles. I found myself to be quite shaky out there and I was constantly correcting my self. The kayak would lean slightly left and I would over correct to the right. Am I saying that the kayak is unstable? Definitely not - I was just overly nervous. Once I figured out that this wasn't going to tip, I decided to just relax and quit being such a baby; after all, I have a life jacket on and the water is nice and clean. Sure enough, as soon as I relaxed, everything fell into place. There were no more feelings of tipping or unsteadiness. Instead, I paddled out to the opposite end of the lake where there were a number of islands. I couldn't help but notice how easy the paddle was and how nice it felt to be out there. Now it was time to fish! I reached behind me and grabbed one of my rods and started casting a natural color swim jig. This took me a minute to get used to this as well as I am not used to casting from a low sitting position. With a few minutes, I had my first bite. I set the hook and after a few seconds, whatever it was came off and so did half of the rubber paddle tail trailer. I am thinking something with teeth grabbed that baby. I also noticed that when I set the hook, the whole kayak changed directions. I wanted to cast back to that same spot, but was now facing the wrong way, so I put the pole down and grabbed the paddle for a quick direction change. Which brings me to my next point - modifications! 1. Rod holder in front of the seat. I did a little bit of trolling and found it difficult to know when I got bit. The only tell tale sign was when paddling seemed to get a bit harder. I would like to be able to view the rods a bit better; this will be great for trolling the big lake for salmon and trout. 2. Anchor/drag chain set up. I think I will ultimately have a chain in the back and anchor up front. 4. Easier location to put the paddle. This way, I can quickly grab it if I need to change direction. As of right now, I think that's about it! I am sure it will be a constantly evolving thing, but for now, I am beyond satisfied. Congrats on the successful maiden!!!!! Now we gotta get you out onto the big lake for some salmon!!!!!! Glad to hear it went well and you will feel more and more comfortable as you use her!!!!! I agree, Tom. If I wasn't busy as hell on Saturday, I could have made it. No problem!! The lake was mildly angry anyway and you probably would not have wanted your first yak outting in 2-4 footers. They do not look like much on the videos, but you will have a little pucker factor when you first paddle out past the harbor mouth. Yaks are safer that those 14 footers and the people with no PFD's on. We will get out! Coho's and Brown's are on the way in!!!! I am learning as I go and hope to be more steadily productive as I learn. Oh you just wait. I can promise you that you'll find a thousand other things to add to that list of 'Things to add'. Glad you're enjoying the yak. Before long you'll have the undying urge to catch anything and everything that swims from it! I think you'll like the Coosa. If there was a kayak I wanted to get, it would be one of them. You should look up Drew Gregory. He designed it and coordinates a bass tournament trail for kayak anglers. If I wasn't in the market for a dream river boat and didn't have 3 other boats and a lack of storage I'd likely get myself one as well. That tournament trail needs to come a bit closer! Looks nice, just took out my new kayak, in 2 days i caught 51 fish. i'll be doing a post on it this week. So far, for me, a kayak has been my best investment in my life, and I hope it continues to serve me well, and yours too!